Avdeevka today is still one of the stress points on all demarcation line. 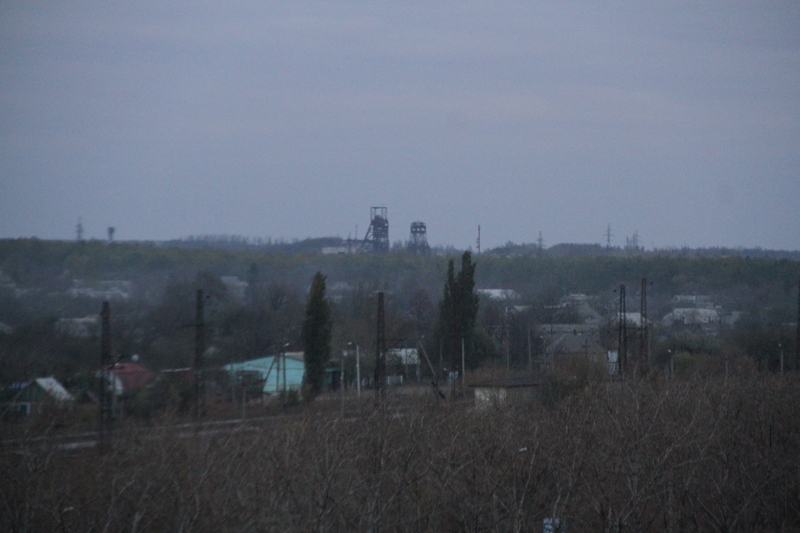 Everyday clashes near Donetsk airport, ‘Butovka’ mine and ‘Promzone’ (Industrial Area), which is directly inside of the city, are seen with the naked eye. The employee of Avdeevka Military-Civilian Administration Sergey Belyaev told to informator.media how to live in the most ‘hot spot’ of Donbass. Looking at a couple of armed OSCE vehicles, located in Avdeevka exclusively in the afternoon, it’s strange to hear not only sounds of shooting at this time, but also explosions of mines in nearly two kilometers from the center of the city. Everything becomes more loudly and harshly at night. – Warfare are taking place near Promzona, where distance between sides is less than kilometer, – tells Sergei. – Almost every day provocations and shellings there take place, mortar and artillery shells hit down. Except this, stray bullets of 12.7 calibre fly into the territory of a plant and even in the center. The area of the city is 29 square kilometers. Far streets – Levanevskogo, Kirova, Chkalova, Lermontova, area near ‘Tsarska okhota’ (Royal Hunt – hotel and entertainment complex on the outskirts of the city, was destroyed in the first year of the war – ed.) suffer in general from shots. The situation has been escalating from the beginning of the February. But, in general, the city was damaged in time of shellings on January 2015, there were hard demolitions at that times. – Are there wounded among civils? – The last cases of victims among civils were in summer 2015, when people went out from city borders and blew up on mines and stretchings. – Do they shot every night now? – Almost yes, even in the afternoon. The escalation on the demarcation line began from the first days of October. We don’t see nearly heavy machinery, but we clearly hear it. I can distinguish artillery, as the military in past, so mortars 82 mm and 122 mm, ‘Vasilek’ (propelled automatic smoothbore mortar of 82 mm calibre – ed.) shot, tank or antiaircraft hit in the drones. Of course, small arms. Snipers are heard, the sound is loud and sharp. You can even detect by volume from what direction the shot. – How many people are in the city now? – According to data of Social Security Department, nearly 2500 IDP almost from Donetsk, Opytnoe, Spartak have registered here. 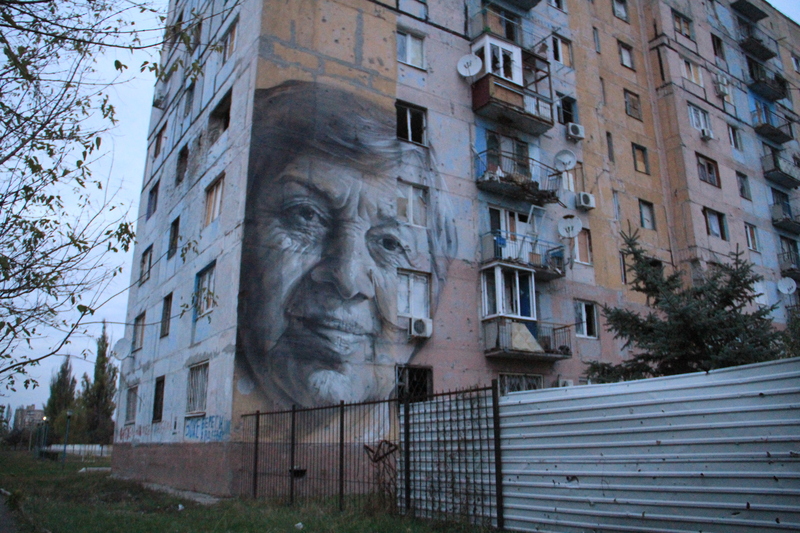 But not everyone is permanently in Avdeevka. Generally, the population in the peaceful time was 37 000 people, 10 000 of them are pensioners. At neighbour, occupied now Yasinovataya was the same number. Now Avdeevka has 20 000 people. People are coming back, also from Russia, they’re sayin’, ‘nobody is waiting for us anywhere’. – It has increased. For example, the rout ‘Avdeevka – Krasnoarmeisk’ works every hour from 6 am to 2 pm, ‘Avdeevka – Slavyansk’ is only one bus a day. Electric train to Chaplino station has been going from spring. Now for times a day. Train-station ‘Avdeevka’ was damaged because of direct hit of a shell on August. Those, who directs to Donetsk, use the main route through Mariinka. They sit on this train to get to Krasnoarmeisk, bus to blockpost goes from there and then there is a transfer. If you order a taxi to go to Donetsk, it is 250 UAH in one side. In Donetsk itself. Cars go through Karlovka and Hornyak. The functioning of City Council was stopped from October 3 in Avdeevka. All power works by law about Military-Civilian Administration… Almost all officials remained in their previous compositions, few fired. The names of posts and functions changed a little bit. – What about preparing to the winter? – The communications, heating mains are hardly but launch. Of course, there is a problem to run houses, because a lot of flats are empty and closed. But work is still going. Also a big volume of works to change windows and repairing of roofs of kinder gardens and schools. There are seven schools in the city and biggest part of them was run. 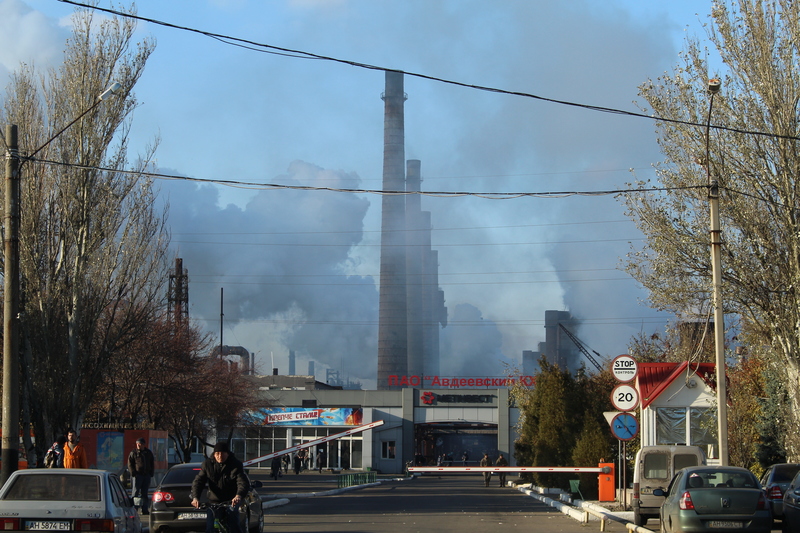 During the conversation Sergei Belyaev noticed, that repair of building become possible thanking to volunteer aid, international funds and main plant of the city -Avdeevka coke plant, heating main connects the enterprise and one of the city blocks – Khimik (Chemist).